Please note that this text is an extract from a reference work written in 1990. As a result, some of the content may not reflect recent research, changes and events. Any numerical cross-references in the text above refer to resources in the Sources and Bibliography section of the Encyclopaedia of Brighton by Tim Carder. 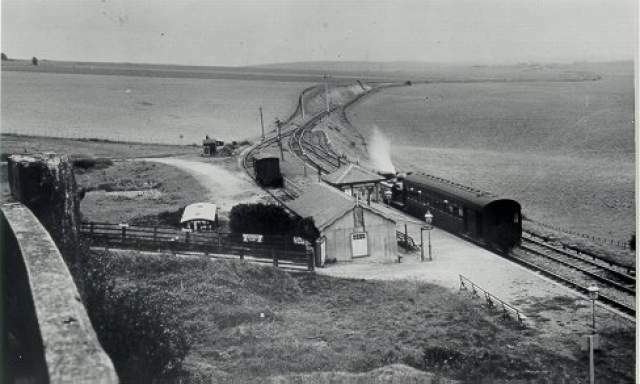 Dyke Railway Station, c. 1920s: Train at Dyke Railway Station. I have never seen a picture of the Aldrington end of the Dyke Road railway. I am sure there has never been a photo as I have never seen one in any of the books I have borrowed from the library. Does one exist? I would draw Jill’s attention to ‘The Dyke Branch Line’, a booklet by Peter A. Harding, published in 2000 by the author himself (ISBN 0 9523458 5 4) and currently still available from specialist transport bookshops (at the time of writing this). This is an excellent short history and description of the line with many pictures. It includes one of a Terrier and ‘balloon’ trailer at Aldrington Halt when the halt was known as Dyke Junction Halt, plus another of the same train passing the nearby actual junction. There is also one of the Dyke branch’s own Sentinel steam railcar at Aldrington Halt platform. I also commend the same author’s similar booklet ‘The Kemp Town Branch Line, 1999 (ISBN 0 9523458 4 6), a similarly comprehensive portrait of Brighton’s other ‘white elephant’ railway branch. I lived at 46 Poplar Avenue from 1974 to 1984. My dad dug up the end of our garden for vegetables and discovered railway sleepers from the old Dyke Railway – wish he had kept them! Great to have seen evidence of this bygone railway! With regard to ALDRINGTON HALT railway station – I have one of the ‘Totem’ signs from there. There’s a great video on YouTube showing the train branching off at Aldrington, going behind Amherst Crescent, Rowan Avenue and I think Northease Drive. Then arriving at the Dyke Station. http://www.youtube.com/watch?v=RCxflHd2MjY I would love to see a photo of Rowan Halt; my dad still lives in the road. My father worked on the Dyke railway when he left school at 14 – children worked in his day – so that would have been around 1936. He travelled every day from Brighton Station to The Dyke and he told me that it was a lovely job. I assume that it was quite busy in the summertime. By 1939 he was in the army, eventually heading out to North Africa. I often look at the images of the Dyke Railway and picture my dad as a young teenager in the prickly worsted uniforms the railway had in those days! “I also commend the same author’s booklet ‘The Kemp Town Branch Line, 1999 (ISBN 0 9523458 4 6), a similarly comprehensive portrait of Brighton’s other ‘white elephant’ railway branch. The Kemp Town branch was no white elephant! It was built to forestall any possibility of the South East Railway Co seeking to enter Brighton from the East, thereby to protect its territory.